Do you crave the excitement of rafting? Are you wondering what it would be like to raft down the American River? Are you looking to create lifelong memories, bond a team, or simply take an adventure? Coloma is the closest town to American Whitewater Expeditions base camp. With a perfect drop-in location to the river, it is a great spot to start your rafting adventure. Ready to head into the rapids? Choose your perfect trip right now! 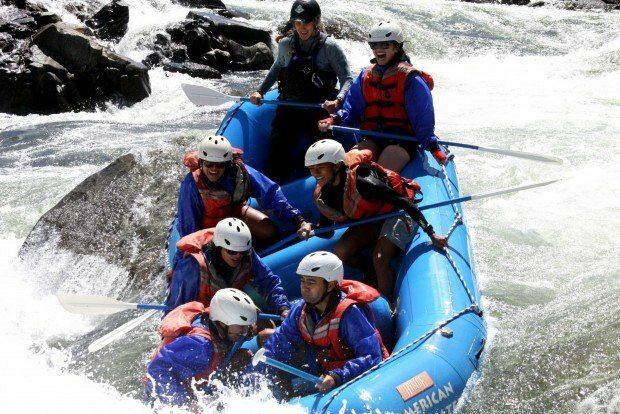 Since the 1970’s, American Whitewater Expeditions has been creating opportunities for people to have amazing experiences rafting the American River. We are one of the most established companies in the area, and we take pride in our extensive knowledge of the areas and river. Each tour we go on shows the passion that we have for whitewater rafting. Our guides also reflect the passion that our company has. Not only do they have unique personalities, but they help ensure your safety. Each of our guides go through training at a guide school where they learn from everything they need to know from seasoned, professional river guides. We only hire the best, so you are sure to have an exceptional guide. Our equipment is pretty great, too! We have state of the art rafts, commercial grade helmets, and Coast Guard certified PFD’s. American Whitewater Expeditions takes your safety seriously. For those wondering about team trips, we have you covered. American Whitewater Expeditions offers the perfect opportunity for a team to bond on the American River. No ropes courses, awkward stories, or trust falling exercises are required. Instead, we let the team bonding occur naturally as each team member works together on the river. The best part is that there is no minimum skill level required. We will make sure that each person enjoys their trip, whether they are advanced rafters or just beginners. We will also take any group that you have. It doesn’t matter whether you are a local bowling team or if you are a company from hundreds of miles away. We want to help you have the time of your life! Not only do we offer team building, but we also want to have your family with us. If you’re looking for a fun family trip, we can provide that. Not only will you have the chance to create family memories, but you will be enjoying the beautiful California sun and scenery as you create those memories. Plus, you’ll be able to get a break from all the duties of home and work. If adventure, California sun, and excellent guides sound like something you want to experience, contact American Whitewater Expeditions! Our enthusiastic staff will make sure that you have a trip that you are sure to not regret. American Whitewater Expeditions is here for your team trips, family trips, and all your whitewater rafting needs. Find the perfect trip and book online, or give us a call today! The River is waiting for you.